You, your team, and your clients have become familiar with certain brand-name drugs for patient care. And even though generic options exist, you and your clients hesitate to make the switch. What’s the hesitancy? What are the common beliefs and misconceptions about veterinary brand-name drugs versus generic veterinary drugs? The main question is: Can generic veterinary drugs be significantly different than, or inferior to, the “pioneer” (brand name) drugs? In this informative quiz, you will test your knowledge about generic drugs versus brand name drugs and discover how generic drugs may help you and your clients save money on treatment, with the same safety and efficacy profile. Pioneer (brand name) veterinary drugs go through more rigorous testing for approval than generic drugs do. Blood-level bioequivalence studies are required by the FDA-CVM for ANADA (Abbreviated New Animal Drug Application) approval, which establishes that any difference in the bioavailability between the generic and the pioneer drugs is considered clinically insignificant. To determine bioequivalence, the generic sponsor completes blood level studies comparing its formulation vs. the pioneer formulation and reports to what extent the active ingredient concentrates in the blood and for how long. 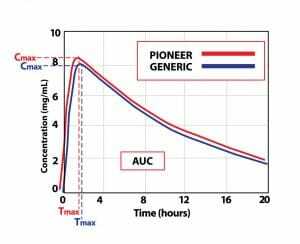 The average or mean results for the generic product must not be significantly different in comparison to the pioneer drug. Designing, conducting and analyzing a bioequivalence study can take as long as two to three years to complete. Below is a graph of a bioequivalence study results illustrating the mean blood concentrations of a pioneer drug (red line) and generic drug (blue line). AUC = Total area under the blood drug concentration-time curve, or drug exposure over time. AUC is proportional to the total amount of drug absorbed by the body, and thus available to produce a therapeutic effect. A generic veterinary drug can have up to 20% less active pharmaceutical ingredient (API). To conduct the bioequivalence study, the same dosage is used for both the pioneer and generic formulations. The FDA-CVM considers two products bioequivalent if the mean Peak Concentration (Cmax) and Area Under the Curve (AUC) are not significantly different when applying a 90% Confidence Interval (CI) approach. The acceptable limits are that the generic product mean must be within 80%-120% (untransformed data) or 80%-125% (log-transformed data) of the mean of the reference product. This allows for individual animal variation in the live animal study. This does not mean that the generic drug is allowed to have 20% less active ingredient than the pioneer. Both products must be formulated to contain the same amount of active ingredient. U.S. generic veterinary drugs are manufactured under identical quality standards as pioneer brands and in FDA inspected facilities. Pioneer drugs and generic drugs must be manufactured to the same high quality standards of the FDA. Both are manufactured in FDA inspected facilities, must meet current “Good Manufacturing Practices” (cGMP) and must be shown to be safe and effective. Generic veterinary drug manufacturers do not monitor their drugs for adverse events and quality complaints post-approval like pioneer brand manufacturers do. Bioequivalent generic veterinary drugs include the same active ingredient and same amount of active as brand name drugs. Generic veterinary drugs usually cost much less than brand-name veterinary drugs. This helps your practice compete (e.g. vs. on-line pharmacies), while allowing you more profit potential. Clients will be happy that you are charging less for certain medications needed for one-time treatments or chronic disease management. A happy client is a loyal client! 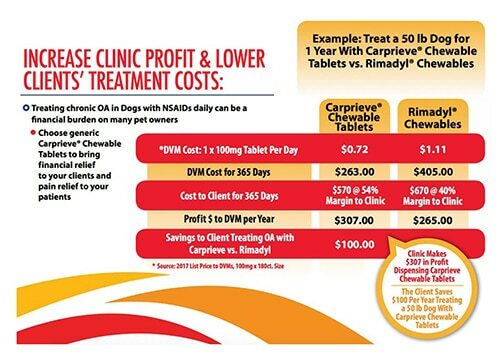 When you look at the following example for chronic pain management with NSAID treatment, you can see how generics can lower your clients’ treatment costs while increasing your clinic profits. So, why not reach out to your distributor sales representatives and ask about the generic veterinary drugs available and start saving today? Editor’s note: This sponsored content is presented by Norbrook, providing quality and cost effective animal health products for the veterinary community for over 40 years. Norbrook is one of the world’s largest manufacturers of veterinary sterile injectables as well as companion animal and livestock private label brands in the U.S. Norbrook manufactures many of its own active pharmaceutical ingredients (APIs), ensuring control over costs and increased confidence in quality. For more information about Norbrook brands visit www.norbrook.com.